All Sanger homes currently listed for sale in Sanger as of 04/24/2019 are shown below. You can change the search criteria at any time by pressing the 'Change Search' button below. 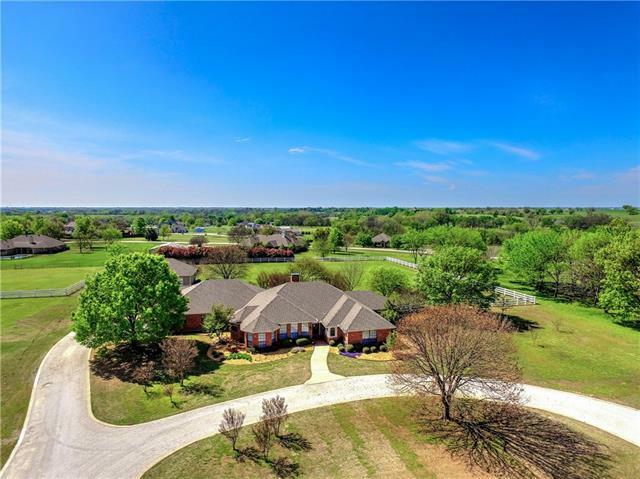 If you have any questions or you would like more information about any Sanger homes for sale or other Sanger real estate, please contact us and one of our knowledgeable Sanger REALTORS® would be pleased to assist you. 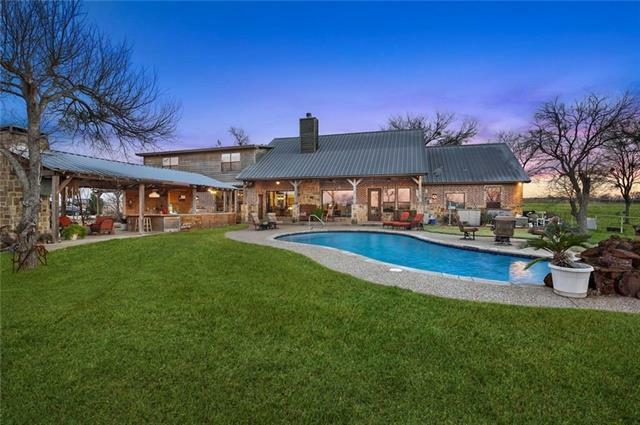 "Revenue generating equestrian ranch located on thirty acres just outside of Sanger, Texas available for purchase now Fantastic, over-sized, rustic-chic ranch house accessible via its own separate entrance with a pool and gourmet outdoor entertaining area. Property features several, very well-appointed barns for on going boarding and hosting of animals for shows. A separate barn is located on the residential tract for the family s livestock. 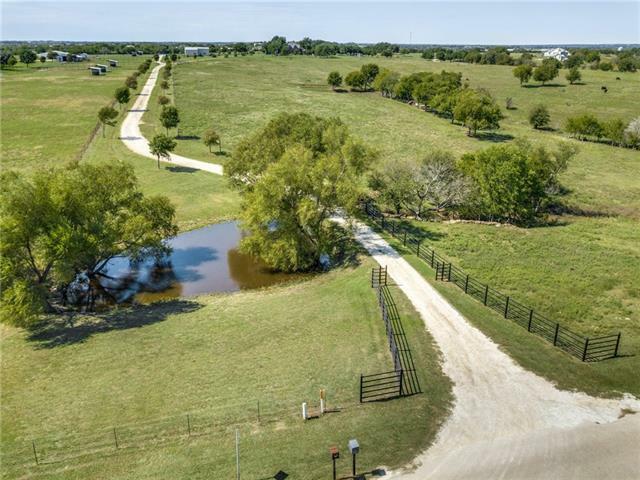 There is a huge arena adjacent to a carriage house ev"
"Haverty Ranch, Rich with Tradition - Income Producing Training Facility with an ideal layout between barns and arenas. 45 miles to Will Rogers Memorial Coliseum in Fort Worth, 165 miles to OKC. 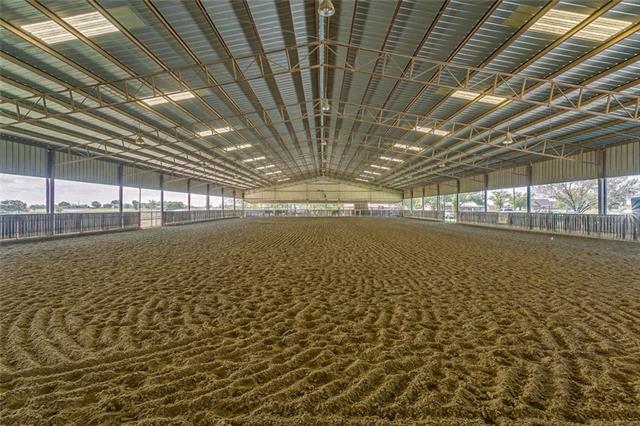 47 miles to DFW Airport 100 x 200 Covered Arena, 24 Stall Barn, 12 or 18 Stall Breeding Barn, 6 Stall Barn. Up to 48 indoor stalls total. Approx 350 x 170 Outdoor Arena, Apprx 170 x 170 Sq Pen, Hay and Shavings Barn, Main House, Second Home, 2 Bunk Houses, Giant Bermuda grass. 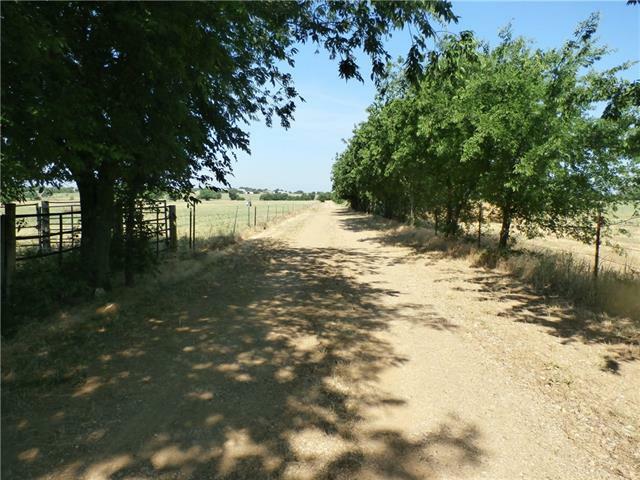 Legal Description of Whole P"
"Perfect sportsman & equestrian paradise, with 53 acres of beautiful rolling hills & 2 stock ponds. 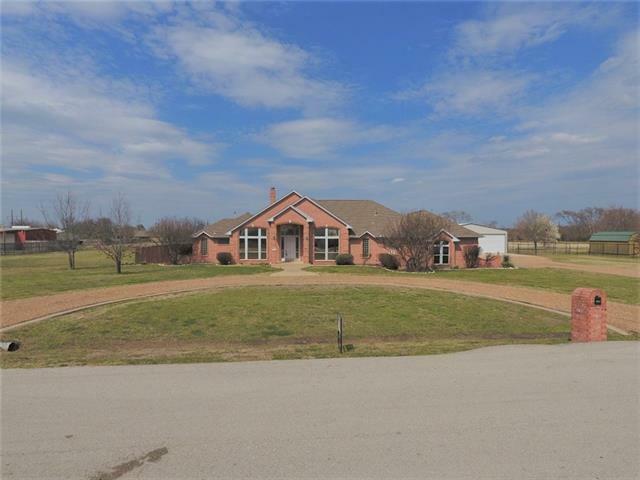 Multiple open horseback riding areas along with a 4 stall stable & horse trailer storage. A shooting enthusiast paradise. You can enjoy your own shotgun sport layout or opt for a 500 yard rifle range. From the large indoor outdoor sun-room, you can enjoy panoramic views of the city of Denton & the spectacular Texas sunsets. The large pond is approximately 3 acres & at the deepest point is 19 ft. Th"
"Here is a very secluded property on almost 89 acres. There is almost 1900 ft of driveway back to the property. There is about 20 ft of road front on Cashs Mill. The value of the property is the land . There is a creek , pasture land that is used for cattle and hay crop. There is an old hay barn and dairy barn. There is about an 2030 sg ft home that has a new roof in 2016,the home was rewired in 2017, New HVAC. But needs work inside. There has been wild turkey seen on the property and probably de"
"Impressive custom one owner home.Completed in Jan 2007 on approx 19 ac in Sanger.Warm and inviting interior, you can't miss the gorgeous stained trim including the vaulted ceiling in the living area, open floor plan, granite countertops, tons of kitchen cabinets and countertop space, decorative lighting and many more details throughout! Home has spray foam insulation on the exterior walls & attic. 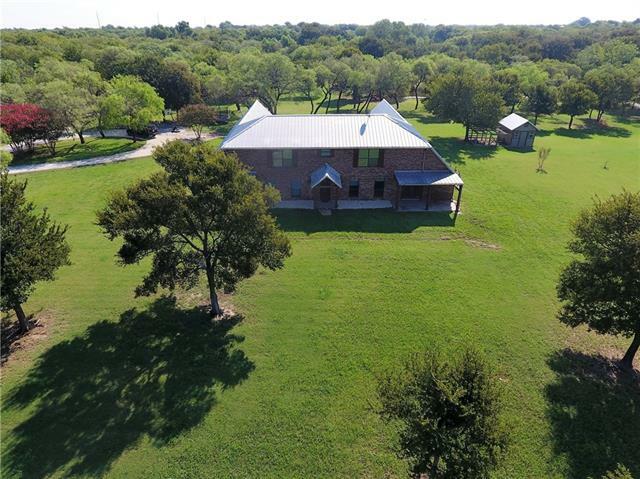 House can be 4 bedroom with 2nd living or 5 bedrooms.Exterior offers covered porches, room to roam,"
"Here is a wonderful horse property , There is 20 acres with a 50 X 55 barn 4 stall inside, wash bay and tack room. Plenty of room to store equipment inside. Also another shelter for a couple more horses.This is a 3 br 2 bath home with a study. Beautiful wood floors. Double sinks in the master bath and master bedroom is downstairs. There is a lot of closets and storage.,There is extra room over the garage entrance in the garage power no HVAC. The home has a wrap around porch on 2 sides and a larg"
"Country charm at its best! 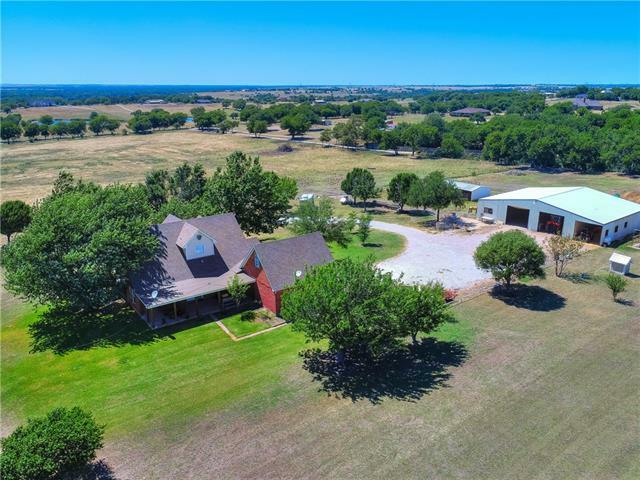 Less than ten minutes from I-35 and Sanger, home sits on rolling 12 acres (plus or minus) that boast beautiful sunrises and sunsets. Spacious two story home features over 3,800 sq ft with open floor plan, wood burning fireplace, alder wood cabinets, five bedrooms (master downstairs), three full baths, office-bedroom and additional game or media room upstairs. Property includes large mature trees, fenced and cross fenced pastures, pond, 47 X 35 workshop with 1 bedroo"
"Backs to corp. property on Lake Ray Roberts, 4 bedroom, master suite down has jetted tub, separate shower, dual closets and sinks, formal dining, office, centrally located living room with view of pool and acreage, island kitchen has lots of cabinets, pantry, and closet, large utility room with sink, cabinets, and freezer space, central vacuum system, separate 3 car garage, 40x60 insulated metal shop has 3 overhead doors and 220 electric, outdoor fireplace, built-in grill located by the pool w"
"Impressive custom built home with stone exterior completed in Jan 2007 on approx. 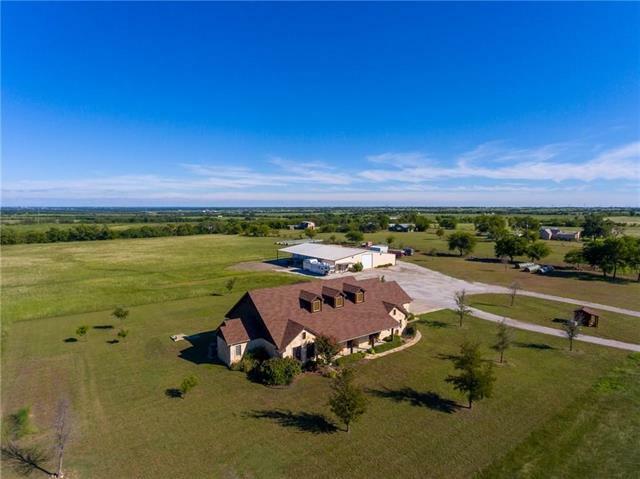 10 acres in Sanger. With a warm and inviting interior, you can't miss the gorgeous stained trim including the vaulted ceiling, open floor plan, granite countertops, tons of kitchen cabinets and countertop space, decorative lighting and many more details throughout. Spray foam insulation on the exterior walls & attic. 2-19 seer HVAC units. House can be 4 or 5 bedrooms. Large Covered Porches with room to roam. Ple"
"Country Living At Its Best in Denton ISD! 2 Story Open Concept Home on highest point in Denton County has Large Balcony perfect for looking at the Stars. Generous Size Master Bathroom has Walkin Shower with River Rock Floor and Room for Two. 8000 sq ft Shop has 1330 sq ft of 3 bedroom 1 Bath Living Quarters, ideal for Mother In Law Suite, College Kids, Rental or Hire Your Own Ranch Hand to Maintain the property and work the 9 Horse Stalls. Office Building or Storage Shed Behind Home ideal for Ho"
"WOW!DREAMING OF A MINI RANCH WITH ALL THE QUALITIES AND MORE OF LARGE ONE?SADDLE UP HANG ON DREAM HAS COME TRUE.RAREST OF FINDS IN THIS CUSTOM BUILT 1 OWNER HOME ON 3 FULL ACRES.HOME FEATURES 5 BEDROOMS 3 BATHS WITH CUSTOM DETAILS AT EVERY TURN INCLUDING THE FINEST OF TILE AND MILL WORK.MAGNIFICENT LIGHT BRIGHT FLOOR PLAN- ALL ON 1ST FLOOR EXCEPT UPSTAIRS BONUS-BEDROOM,CHEF'S DELIGHT DREAM KITCHEN,OVERSIZED GARAGE, AND MORE...PLUS.. APPROX 70X40 BARNDOMINIUM DESIGNED AROUND INTERIOR AND EXTERI"
"This immaculate home is an unusual find that is loaded with countless upgrades! Located off 2450 on 5 full acres, it boasts top of the line updates including: Travertine & wood floors, surround sound wiring inside & out, art niches, copper sinks in all baths, upgraded granite throughout, under cabinet lights, stone & brick facade & accent features inside, framed mirrors, granite tile surround jetted soaking bath tub, dual head walk in shower, Knotty Alder cabinets in kitchen & M bath, butler's p"
"Peaceful country home sitting on 5.535 acres with beautiful views of wooded acreage and mature trees. Unique home features an open concept living, dining and kitchen with granite counter tops, commercial gas stove and windows for plenty of natural light. Master bedroom and bathroom are downstairs with two sizable bedrooms and bathrooms upstairs. Guest quarters feature two bedrooms, one bathroom, kitchen, sun room and windows that overlook the covered porches and pool. Property also includes"
"This is a builder's personal home with too many extra features to list. Living area has vaulted ceiling with wood beams, stone fireplace, hand-scraped wood floors, and lots of natural light. Kitchen has tons of storage, glass front display cabinets, a custom moveable island that can be used as a breakfast table, JennAir range, Bosch dishwasher, and a buffet-serving bar area. The master has his & her closets, dual vanities, separate shower and jetted tub. 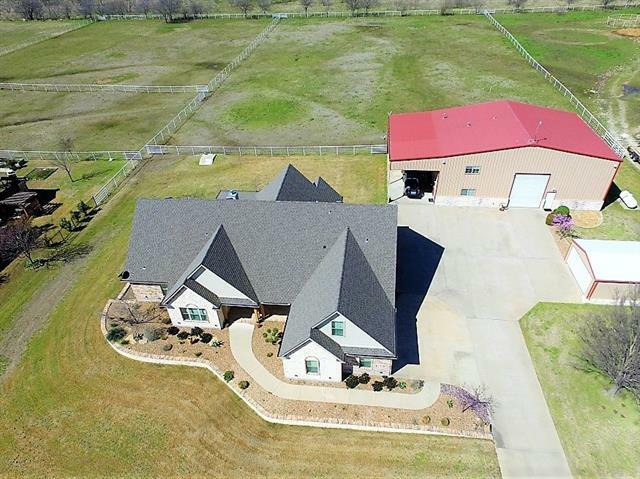 Second living has fireplace, built in sh"
"Here is a wonderful horse property , There is 20 acres with a 50 X 55 barn 4 stall inside, wash bay and tack room. Plenty of room to store equipment inside. Also another shelter for a couple more horses.This is a 3 br 2 bath home with a study. Beautiful wood floors. Double sinks in the master bath and master bedroom is downstairs. There is a lot of closets and storage.,There is extra room over the garage appr 273 sg ft entrance in the garage power no HVAC. The home has a wrap around porch on 2 s"
"!Immaculate Custom MOVE in READY Home with an additional 1181 SQ ft 2 bedroom, 2 bath, kitchen and laundry room Mother in law suite! Main house offers a wide open kitchen and living room that is flooded with windows for natural light. 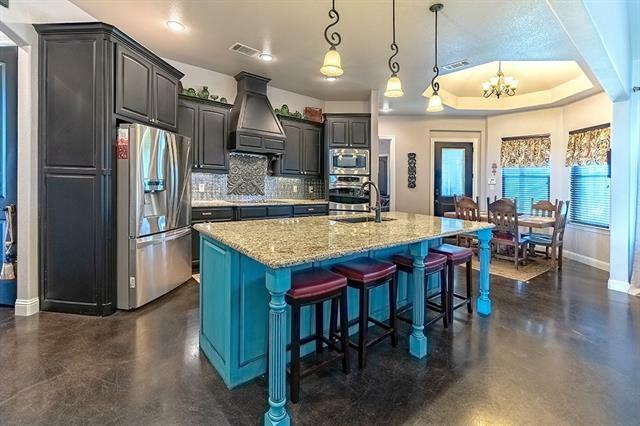 HUGE working island is centered in the state of the art Kitchen fit for any chef! Double ovens, prep sink, wine chiller and SS appliances with granite counter tops. Media Room opens up to the back patio as it is versatile with it's perfect location, Master bed is "
"Luxury Living in North TX! 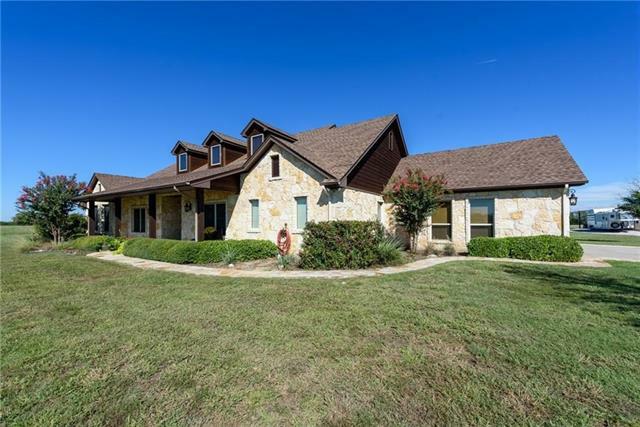 Relax And Enjoy This Amazing Multi Level Home Perfectly Situated on 1.6+ Acres Less Than 1 Hour From DFW. You Will Immediately Be Drawn To The Gourmet Kitchen With Granite Counters, Beaded Panel Custom Cabinetry With Round Molded Corners, Center Island & Decorative Backsplash. Main Bath Offers A Stunning Walk Thru Tile Shower, Garden Tub, Dual Vanities. Enjoy The Sunsets On The Balcony Overlooking Your HEATED Pool & HEATED Jacuzzi. Have Movie Night In The Large Upstair"
"PERFECT for entertaining!! This custom home is STUNNING! Spacious open floor plan with floor to ceiling windows offering an abundance of natural light, granite kitchen counters with custom cabinetry. Get away from it all in the gunite POOL surrounded by the landscaped backyard with a covered patio and deck. 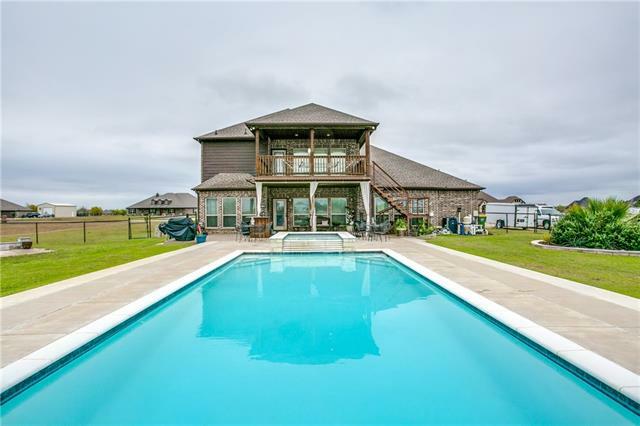 Just beyond the pool you can enjoy your horses or open space the acreage provides. 40x45 insulated shop offers additional parking for your toys!" 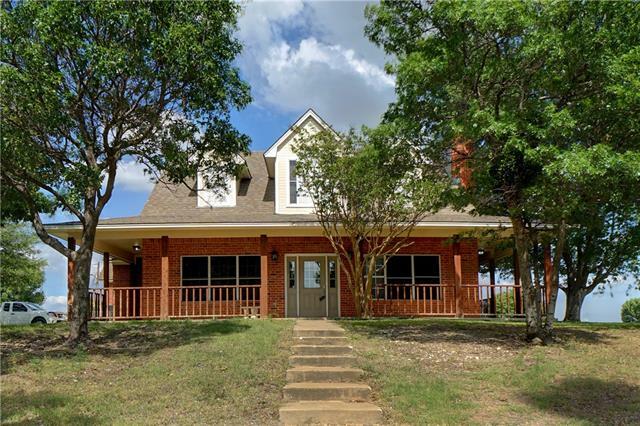 "Beautiful country home sitting on approx 7.62 ac less than 10 minutes from Sanger, I-35 and 20 minutes of North Denton. Home features spacious split bedroom arrangement with open concept living, dining and kitchen. Massive kitchen offers room for entertaining with large island, bar area, quartz counter tops and built-ins. Property also includes approx. 700 sq ft guest quarters with living, kitchen, one bedroom and bathroom. 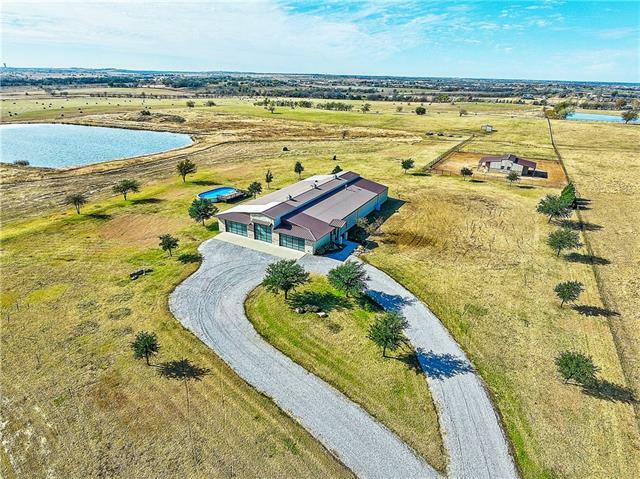 Plenty of storage with a 37 X 36 workshop with electricity and 2 rol"
"Custom built home on acreage features stained concrete floors throughout the house, a 6.5 inch engineered post tension slab. Foam attic insulation makes the electric bills very low. 10' ceilings, knotty alder cabinets with soft close hinges, wood burning fireplace with blower, large mudroom, big utility room and an awesome master bathroom. Two bedrooms on one side of house with a jack and jill bath, and the master bedroom on the other side of the house. 4th bedroom currently being used as an o"
"The San Marcos is a great open floor plan for entertaining! The kitchen and breakfast room overlook the family room at the back of the house. The master bedroom suite includes a master bath with a garden tub, storage closet, and private commode. There is also his and her vanities and separate tub and shower. Two of the additional bedrooms are conveniently located next to each other with a bathroom in between. Separate from those is a 4th bedroom with a 3rd full bath! 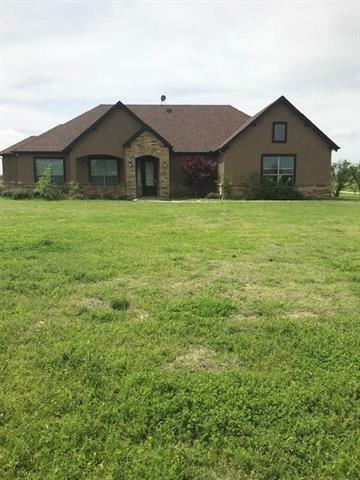 Take action and come view th"
"BEAUTIFUL HOME SITTING ON 2 ACRES IN KRUM ISD. BUILT IN 2012, THIS HOME OFFERS A GREAT OPEN FLOOR PLAN, WITH TALL CEILINGS,PERFECT FOR ENTERTAINING. THE LARGE MASTER SUITE HAS A HUGE WALK IN CLOSET. ALSO ONE GREAT FEATURE IS THERE IS A JACK AND JILL PLAY ROOM IN BETWEEN THE 2 SPARE BEDROOMS. THERE IS ALSO AN OFFICE OFF OF THE FOYER AND INSULATED SHOP. Don't let this one slip you by! Sellers name is Secretary of Veterans Affairs. 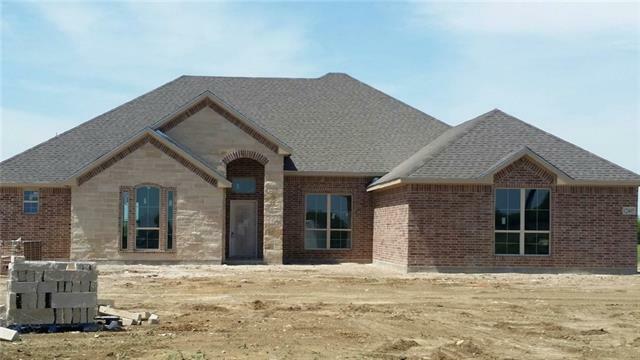 Seller does not pay customary closing costs, including title poli"
"New construction 4 bedroom custom home on nearly an acre lot! 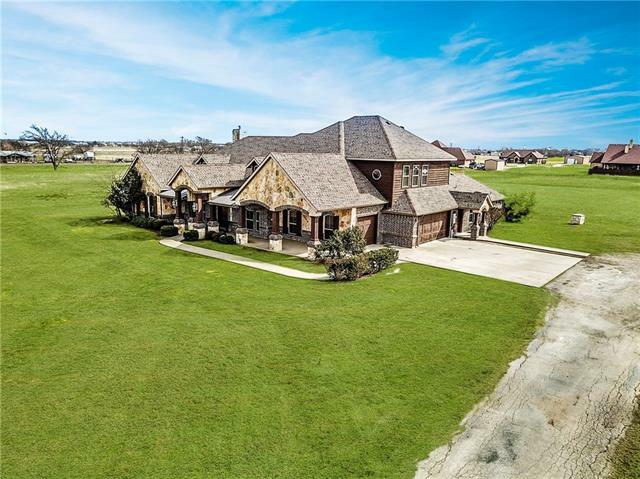 This elegant home with it's country setting offers enough room for horses, RV and boat parking or build that perfect shop you always dreamed of. 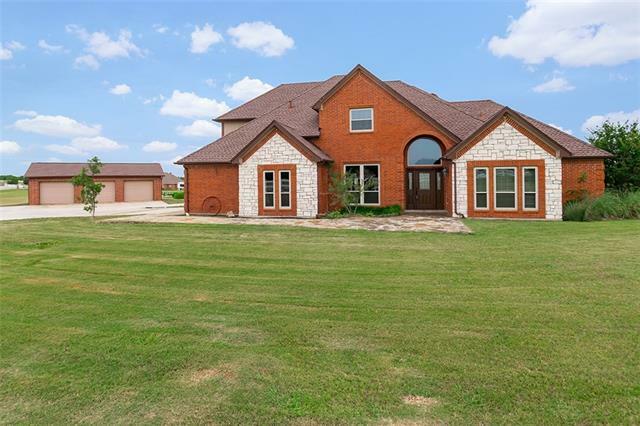 Boasting a split bedroom layout with huge bedrooms, a grand family room dressed with a wood beam 11 foot ceiling, wood like tile flooring in all central living spaces and a wall of windows overlooking the covered patio and acreage, this home is incredible. Complimenting this open plan is a"
"Brand new house just being built. 4 bedrooms 3 full bathrooms and a 2 car garage that is on the side of the house. Open concept kitchen and all electric. Quiet country living on 1 acre of land with some mature trees. Home should be completed end of June 2019. Pictures online are only a representation of the home. NOT ACTUAL PHOTOS"